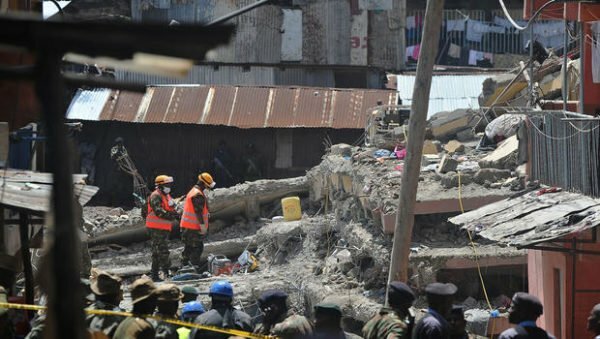 A Kenyan woman has been rescued from rubble in Nairobi, six days after the building collapsed in heavy rains. The woman is being taken to a nearby hospital for treatment, Kenya Red Cross says. Thirty-six people have been confirmed dead following the building collapse of the six-storey residence on April 29 and more than 80 people are still missing. The building’s presumed owners have been released on bail after being arrested on May 2. Rescuers worked to get the survivor free after the woman was found on May 5. Bystanders who had been watching the rescue in Nairobi’s Huruma neighborhood applauded as she was carried away on a stretcher. The head of Kenya’s National Disaster Management Unit, Pius Masai, said there is still hope that more people would be found alive. A six-month-old child was pulled alive from the rubble on May 3, but her mother was found dead the following day. Nairobi authorities say they had earmarked the building for demolition after it was declared unfit for human habitation. An official audit of Kenya’s buildings found that more than half in Nairobi are not suitable for people to live in.